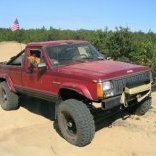 I'm converting my 87 Comanche cooling system and getting ride of the Heater valve. I have all the parts now to do this. Before I start the conversion I wanted to put a drain valve in the heater hose mostly to get rid of the air. I saw this being done a while back but don't remember if the inline valve was in the top heater hose or the lower hear hose. If someone could help me. I've never had a problem burping a cooling system........don't know why this is such an issue. burping locations need to be as high up as possible where the bubbles could congregate. With rad cap off- Idle to temp, shut off, let rest for 3-5 minutes, will self burp, idle to temp, shut off, self burp, idle to temp, top off radiator and install cap.